You know what I mean? Like in Macy's 'n' such? Even his name sounds like a bad department store house brand. So there you have it: there are now two Mormons in the race. 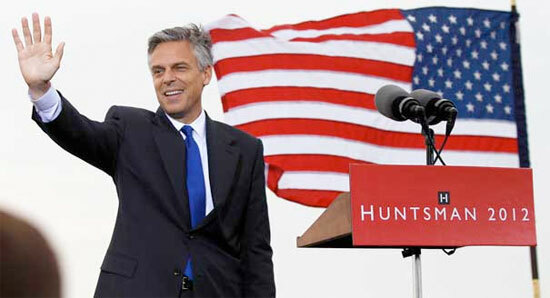 One of them pretends to be moderate but really isn't (Huntsman), while the other pretends to not be but really is (Romney). Republican primary voters are sure to love them both. He's missing the requisite American Flag Lapel Pin. He'll never get elected without one. Oh, and his American flag is flying backwards, which means he's a communist. Agreed. A friend thought it had a hotel logo feel to it and I agree with that too. Isn't it Jon though? Far be it from me to be your copy editor, but I had to say something. From now on, I will refer to him as Jon Huntzfigger. Got one the size of my outspread hand living in my bathroom. I've named him Steve, but I shall name the next one Jon. Mitt Romney would make an excellent menswear model for Huntsman Dept. Store's fall lineup. Don't worry about the misspelling, Princess. Huntsman's own campaign guys misspelled it on their press passes yesterday. Double haw! Brrrr. That Huntsman spider is creepy! We are glad we don't live in Florida any more (since the wiki page says it can be found there as well). Also, the Huntsman spider has eight eyes. What does that mean, politically? My god, I particularly hate the stuff he released this summer. Somehow managing to encapsulate both the worst of frat boy goofiness and country club patricianism. Tommy Hilfiger's logo already looks like a really bad department store house brand, so this is actually Dreadful Squared. But there is still hope that Caribou Snowbilly will enter. Then one of the other candidates is sure to get the GOP nod and we get piles of comedic gold.